(L-R) Sesenieli Tinai and Makelesi Momoyalewa of Maururu part of the workshop at Nakavila settlement. Access to proper drainage and better infrastructure, are the priority issues for Maururu settlement, in the district of Nailaga in the province of Ba. 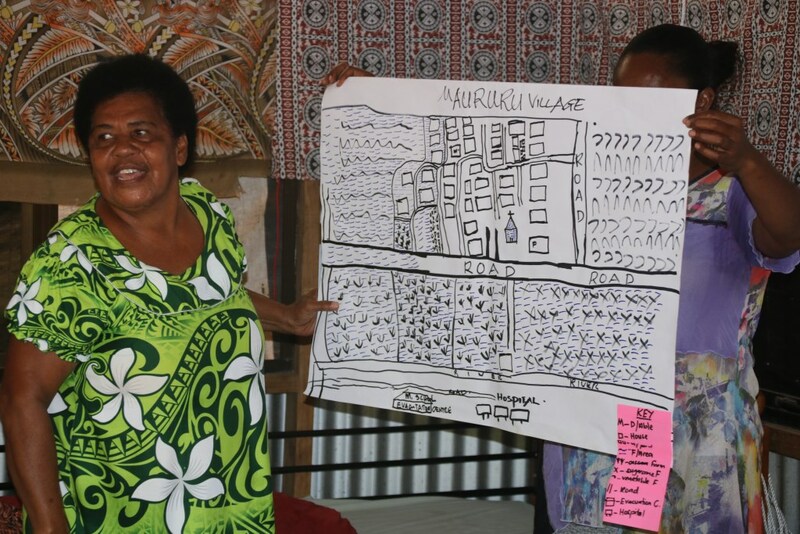 Maururu settlement is part of Nailaga district’s continuous sustainable development plan discussions which was recently carried out by WWF-Pacific through its ‘Living with Change: Resilient Mangroves, Fisheries and People of Fiji and PNG’ project. The discussions with community members from Nakavika settlement, is part of the Nailaga 20 Year 2018-2038 Sustainable Development Plan. 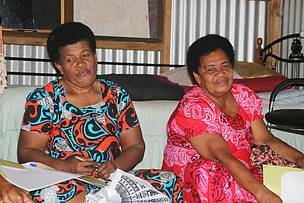 WWF-Pacific’s climate change support officer, Apolosa Robaigau says each village and settlement that make up the district of Nailaga, will identify key issues that the Tikina Nailaga Development Committee (TNDC) can address in the next five years. Sesenieli Tinai of Maururu settlement said upgrades in infrastructure for the settlement is a great need. “Even the flooding earlier this year, destroyed our only access to the settlement which is the bridge, however government managed to build a new one,” Tinai said. The heavy downpour and flooding over the years, has also washed-out the gravel surface of the road, leaving the road dustier during the dry season. “Our roads use to have a lot of gravel however, the heavy rain and flooding have washed the roads clean off the gravel and now it’s quite frustrating when we walk to catch transportation from the main road, we are greeted with a lot of dust from vehicles passing by,” Tinai said. 62 year old, Makelesi Momoyalewa of Maururu settlement highlights that there is a need to have upgrades in basic infrastructure such as their meeting hall, the health dispensary and foot paths within the settlement’s compounds. “We are a small community and such upgrades will improve the standard of living for us with an elevated and disaster proof meeting hall, we won’t have to go to the nearby Namousau Methodist School, which is around 5-10 minute walk in times of a natural disaster such as flooding or a cyclone,” added Momoyalewa. Momoyalewa adds for Maururu settlement, it is quite difficult accessing such upgrades in basic infrastructure as they are an informal settlement; however, she believes the formed TNDC can bring about change. “The committee formed is great as we also have members of Maururu part of the TNDC, this ensures our goals and aspirations can be taken into account as we also come under Nailaga district and developments and issues ear marked by the district and the TNDC, can be addressed with the proper support from government and stakeholders such as WWF-Pacific,” added Momoyalewa. 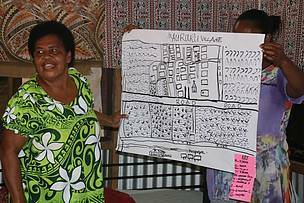 The “Living with Change: Resilient Mangroves, Fisheries and People of Fiji and PNG” project is a three year project that is funded by the German government and implemented in the districts of Nailaga, Nacula and Tavua by WWF-Pacific and WWF-Germany. Makelesi Momoyalewa of Maururu presenting Maururu settlement's map layout and the impacts of natural disasters during the Nailaga district consultations.